The quality of a cell signal, not just its strength, can determine whether a cell will follow a path toward cancer. This finding, which emerged from optogenetic interrogations of both healthy cells and cancer cells, stresses the importance of signal timing, or rather, the ability of cells to “hear” signals distinctly enough to respond appropriately. Unfortunately, mutations that affect signaling molecules can muddy a cell’s signal processing abilities. Also, drugs that dampen cell signaling in an attempt to suppress cancer may have unintended consequences, actually triggering new tumor formation in cancer patients. Optogenetics, a technique that involves the installation of light-sensitive proteins into cells, has often been used to stimulate electrical signals in neurons. The technique, however, may also be used to stimulate chemical signals, including growth signals that may go awry, causing cells to proliferate wildly. Using the latter optogenetics application, scientists based at UC San Francisco experimented on the central Ras/Erk growth signaling pathway (also known as the Ras/MAPK pathway). In healthy cells, this pathway allows cells to interpret external cues about how and when to grow, divide, and migrate, but defects in how these messages are communicated can cause cells to grow out of control and aggressively invade other parts of the body. Such mutations are found in the majority of human cancers, making treatments for Ras/Erk defects a “holy grail” of cancer research. The UC San Francisco scientists used optogenetics to control signaling in cultured human or mouse cells. Specifically, they activated and inactivated the Ras/Erk pathway, the core of which is a cascade of signaling molecules—Ras, Far, Mek, and Erk. Ras sits at the cell membrane and receives incoming signals, then passes them along to Raf and Mek, which process and amplify them, until finally Erk (also called MAP Kinase or MAPK) transports the signal into the cell nucleus, where it can activate the appropriate genetic programs. Previously, researchers had little understanding of how the timing of growth signals impacted cells' behavior. To address this question, the researchers engineered cells to trigger Ras activity in response to precisely timed pulses of light. Using a high-throughput plate-based procedure, the researchers were able to rapidly stimulate hundreds of different experimental groups of cells with a variety of test patterns, and simultaneously read out their responses under a microscope. The results of this work appeared August 31 in the journal Science, in an article entitled, “Cancer mutations and targeted drugs can disrupt dynamic signal encoding by the Ras-Erk pathway.” The article describes how healthy cells respond selectively to long-lasting growth signals, while ignoring signals that flicker on and off—presumably considering them to be irrelevant “noise.” In contrast, the researchers found that certain non-small cell lung cancer (NSCLC) cell lines appear to misinterpret these intermittent noisy signals as stronger, sustained signals, triggering excessive growth and tumor formation. 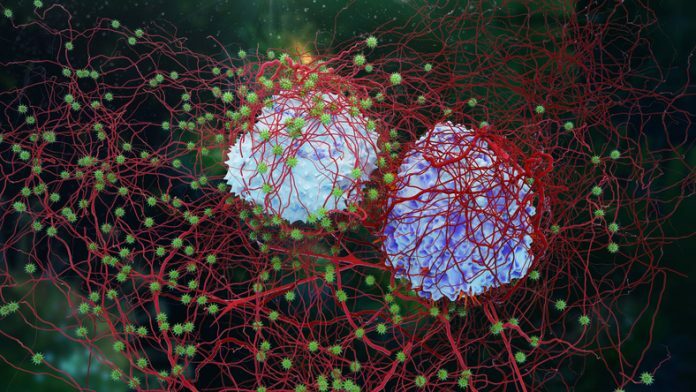 The researchers also showed that some targeted cancer drugs that are intended to shut down overactive components of the Ras/Erk signaling pathway may blur the fidelity of signaling much as mutations do. Essentially, short pulses of Ras activation caused growth signals to reverberate longer in B-Raf mutant cells and cells that had been subjected to drugs, in this case, drugs called paradox activating B-Raf inhibitors, specifically, vemurafenib and SB590885. “This new technique is like a diagnostic instrument that we hook up to a diseased cell, which lets us stimulate and interrogate the cell with many light-based stimuli to see how it responds,” added UCSF synthetic biologist Wendell Lim, Ph.D., one of the study's senior authors. “Using this approach, we were able to identify cancer cells that have certain defects in how they process signals, behaviors that lead to cell proliferation in response to signals that normally are filtered by the cell circuits.